When we began planning for this summit almost 12 months ago, we had a vision of bringing leaders from across the state together. Leaders of business, leaders of conservation, leaders from every industry. I’m proud to share that we have about a 50/50 split between conservation organizations and business leadership here today. We’ll have a true melding of minds. We have representation from oil & gas, construction, wildlife conservation, transportation, retail, state parks, defense, grocery, government, technology, land conservation, banking and finance, higher education, healthcare, historical preservation, architecture and development, health research, media, water conservation, national parks, and K12 education. As I was preparing for opening this summit, I did a lot of thinking about what a diverse group such as this has in common. I kept coming back to the fact that we’re all Texan – whether we were born here or got here as fast as we could. But what does it mean to be Texan? Well, many of you are at least slightly aware and perhaps you’ve embraced that we Texans have a long history of bragodoccio, boasting, pride….whatever you want to call it. Edward Smith once said that Texans ignore “better,” long ago forgot the useless word “good.” Everything in Texas is “best.” But why? Maybe it’s in our landscape. When some people think of Texas, they think of the Hollywood version – desert and cowboys. However, Texas is incredibly geographically diverse. With 11 distinct ecological regions, 14 soil regions and 10 climatic regions, we won’t be pigeonholed–we have a little bit of everything in this state! We have everything from mountains, to canyons to wetlands to coast to prairie to yes, desert. It’s a wild, vast landscape that we’re passionate about. We have 103 state parks, 2 national parks, and 2 national monuments. There are over 150 organizations in Texas focusing on conservation of some type. From a people perspective, we’re also big – 28.5 million strong with the largest population growth in the United States at the last census. From a land mass perspective, WE are twice the size of Germany or Japan. So, we’re big in land, we’re diverse in ecology, we have a lot of people – and our business is second to none. Texas’ GDP was $1.49 Trillion in 2016 – the 10th largest economy in the world. We have four of the 11 largest cities in the US, and have led the nation in state export revenue since 2002. We lead the world in oil & gas, solar energy, and wind energy. Texas is big – in land, in people, in economy. I share all this both to welcome you today, and also to have you think about the opportunity that is unique to us. What do you get when you pair the world’s 10th largest economy with over 150 conservation organizations, tremendous natural resources and leadership mindset that won’t be hemmed in? You get opportunity. Opportunity to lead the world in developing a model of collaborative conservation. Opportunity to think about how we accelerate and measure the return on what we’re putting into conservation – our Return On Conservation. Opportunity to sustain and expand our leadership across all sectors. Opportunity to attract and retain the brightest minds. 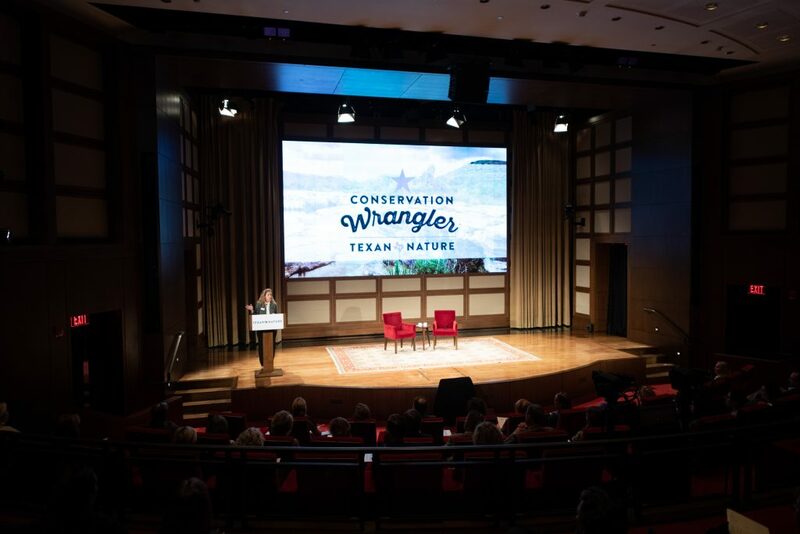 Opportunity to develop healthy Texans, economic growth, and conserved natural resources for generations to come – a Return on Conservation that benefits us all. The opportunity is ours, and I’m thrilled that each of you are here today to take part in this opportunity.